YYZ Bambina: Disney's TinkerBell and the Legend of the NeverBeast in stores now! 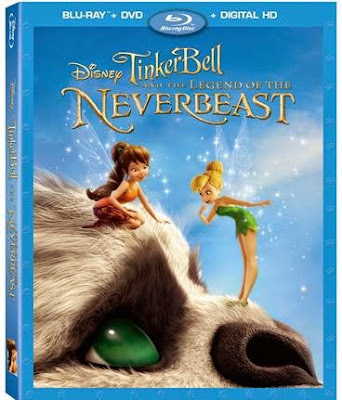 Disney's TinkerBell and the Legend of the NeverBeast in stores now! Hannah has liked TinkerBell since she first opened one of her friends in a Kinder Surprise egg. So she was really excited to watch TinkerBell's latest movie - TinkerBell and the Legend of the NeverBeast. The movie begins with Fawn rescuing a baby hawk named Hannah...so we immediately paid attention and were brought in to the movie. When Fawn first meets the NeverBeast Hannah was a little scared, but she quickly learned the NeverBeast had a good heart and was rooting for him until the very end. Our favourite special feature was "Tink'n about Animals" a fun song Fawn sings about a variety of of animals and the name of their groupings. Have you watched TinkerBell and the Legend of the NeverBeast? I haven't seen this yet but really looking forward to Z getting into Fairy's and other Disney classics!